In case Y’all haven’t heard the news? Female driver Maria De Villota has been announced as Marussia’s Test & Reserve Driver - in what surely is nothing more then a PR exercise, as even the Happy-Happy, Joy-Joy Media-speak from Marussia denotes how the 32-year old Spaniard won’t actually drive the car ‘til the Young Drivers test at Abu Dhabi next December? As the test won’t occur until after the Brazilian GP on November 25th, unless it’ll occur whilst the teams are at Yas Island previously? Hmm? This seems possible with the Abu Dhabi GP on November 4th and the debutant COTA event at Austin, Texas a Fortnight later on Nov. 18th. Yet the whole point of this rant is NOT to condemn Maria or women in general, as it’s surely high time another Femme Fatale made waves in Uncle Bernaughty’s circus, eh? It’s just the fact that is De Villota really the right candidate? As reportedly she lacks a FIA Superlicense - perhaps part of the reason she won’t be taking part in any Friday morning testing? As Maria’s CV highlights seems to be prattling ‘round in the Superleague, albeit the Lotus-Renault XP Caladrocious gang gave her some seat time in one of their F1 chassis last year. Hmm? 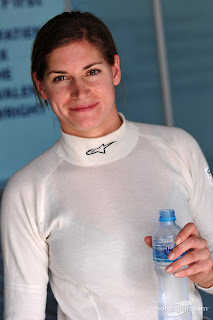 Perhaps the original Swiss Miss, nee Cyndie Allemann, (Age 25) the ex-Indy Lights driver who’s currently languishing in relative obscurity in the Japanese GT series would have been a better choice? Not to mention what happened to ‘KanaDuh’s Great White hope thee Young ‘Wicky, aka Robert Wickens, you know the reigning World Series by Renault (WSR 3.5) champion. Or does that simply speak volumes regarding the real reason behind Marussia’s inking of De Villota? Guess Who’s Birthday it is? My little Go Daddy Girl! INDYCAR: Will Lotus answer the Bell?